For the first time, I'm offering one of my paintings for sale in an auction format. This little hunter was painted on a 5x7 inch canvas panel with professional grade oil paints. He was inspired by the brave fellows who are always squabbling in my backyard. Click here to view him in my Daily Paint Works Gallery. Happy bidding. Day Lillie's are one of my favorite flowers. They fill up the landscape and share massive blooms day after day. Although each flower only lasts a day, they are prolific at presenting a delightful collection of blooms every day for most of the summer. This dark red lily from my yard was my inspiration for today's painting. A collection of little glass bottles seemed an appropriate accompaniment. The painting is 6x6 inches and is for sale at Etsy shop along with some of my other still life oil paintings. Click here to view it in the shop or make a purchase. Fall is coming; the days are getting shorter, and it won't be long until we start to see the autumn colors. 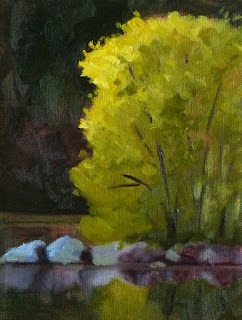 This 11x14 gallery-wrapped painting was created with the season in mind. The original painting has been SOLD, but reproductions are available here. 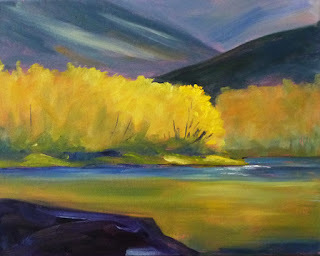 You can see more autumn landscape paintings at Fine Art America. The ground is wet, but the paint is dry on this one. 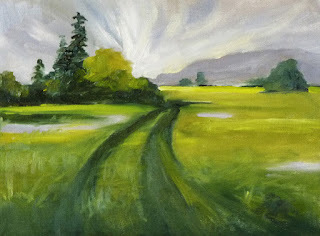 Inspired by the sky after a summer rainstorm, this painting is 9x12 inches on a gallery-wrapped canvas. I remember how cool and fresh the air feels after one of these summer dousing--so refreshing. Visit this link to make a purchase. In the summer, my backyard provides so many moments of inspiration for painting that I can't seem to paint them all before the garden changes and new things sprout and beg to be painted. 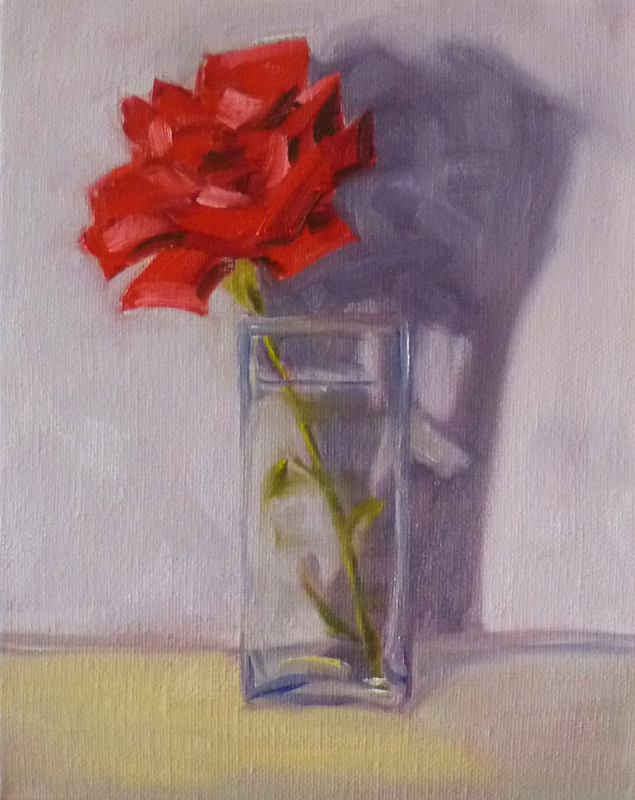 I clipped this single rose last night, set it on the table, enjoyed its beauty, and painted. The painting is 8x10 inches on a gallery-wrapped canvas. It can be viewed or purchased by visiting this link. 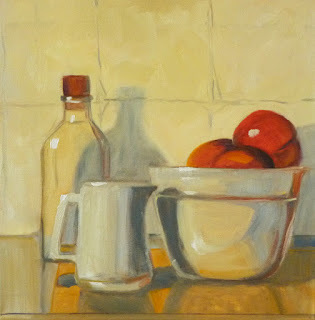 Working on the values in white ceramic and glass are always a good challenge. My first attempt on this 12x12 inch painting was wiped out with a paper towel and a some mineral spirits. When I finished the second attempt, I decided oil paint loves me. It is so forgiving. To go from a muddy mess of malformed objects to an entirely new painting feels really good. 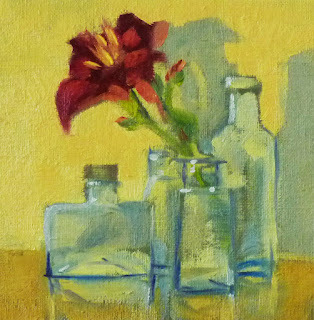 Right now this painting is for sale at my Daily Paintworks Gallery along with my other 12-inch square paintings. Most of my smaller studies are still available at Etsy. Click here to purchase this painting or view it in the gallery. Inspired by the unruly mint growing in my yard and the fresh nectarines on my table, today's painting includes a plant for which I am planning certain death. If you've never grown mint, beware; it is a carnivore. A few years ago, a friend gave me a small mint plant. She warned me that it spreads easily, so I probably shouldn't plant it in the garden. Instead I planted it in a small flower pot, assured that it would be great on my deck. Needless to say, I was careless. It went to seed and blew all over the back yard. I didn't really pay too much attention, not knowing it could result in disaster. The next year there were mint plants in the garden, plants that were not invited. They were pretty and smelled nice, so I let them continue sharing a home with the rest of the yard even though they were not on the guest list. Now, several years later, it has invaded the entire north side of the garden. It is beautiful and smells delicious, but it is greedy and won't share with other plants. So, as soon as the weather cools, this selfish little beauty will be pulled out, doused with Round-Up, and no funeral will be held. 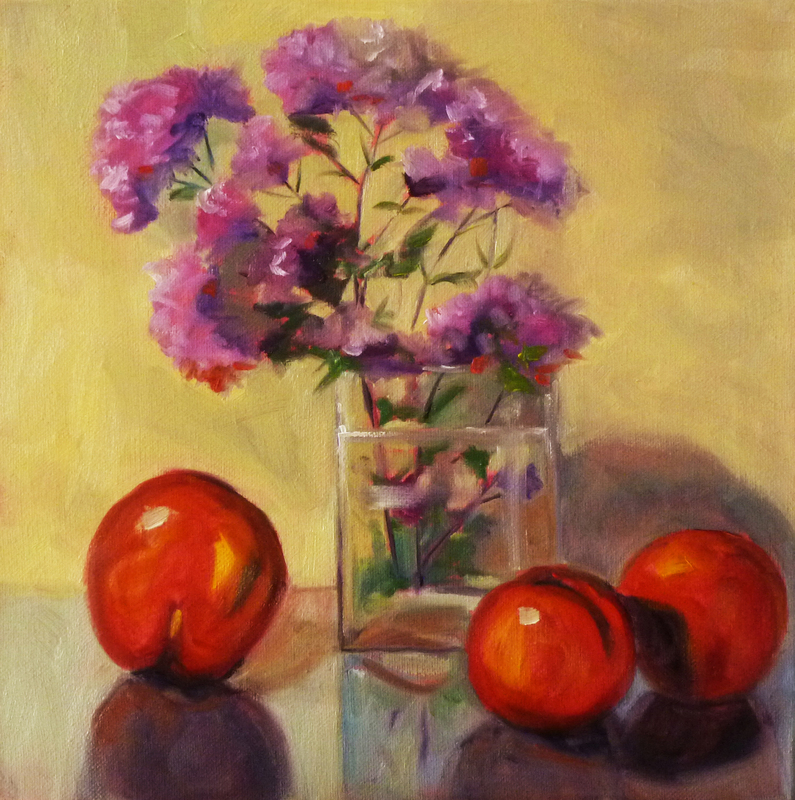 The painting is 12x12 inches on a gallery-wrapped canvas and can be purchased here at my Daily Paintworks Gallery. The paint is wet, so it will be several weeks before it can be safely shipped to a new home. I promise not to include any small starts or seeds. Canvas and paint only. Nothing like a summer vacation, a fishing pole, and a paintbox to get relaxed. This 6x8 inch painting was inspired by all of those. Unfortunately, the paint is wet and I had to leave it drying at our summer getaway. 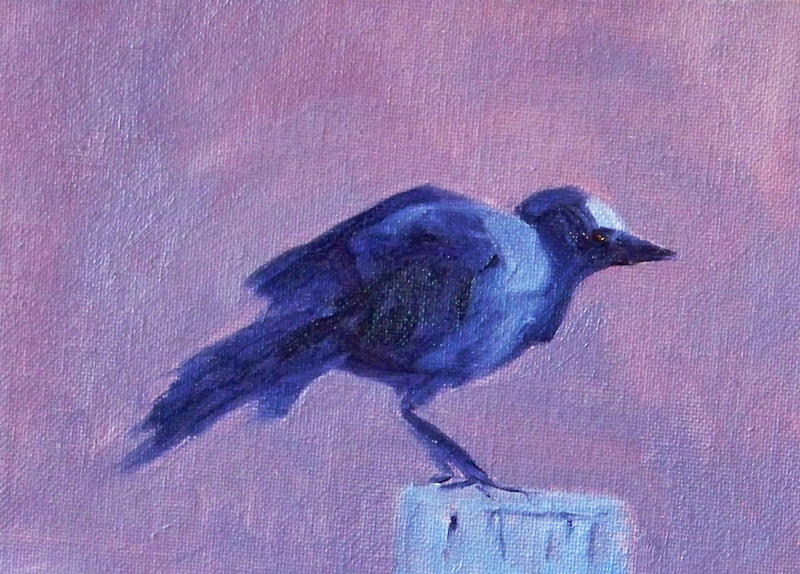 In a few weeks, I will retrieve it and put it in my new Paintworks Gallery. Visit this link to view or purchase in the gallery. My gallery at Daily Paintworks Gallery is filling up nicely. It is always a challenge when a new online venue is undertaken. New procedures, glitches, and temporarily unanswered questions arise. There is usually a learning curve of several days. However, I must say, so far the experience has been great. No glitches and no unanswered questions. This painting is the third is my 12x12 still life series. The paintings were created on a 3/4-inch gallery wrapped canvas. You can view the others here and here. All three are for sale in my Paintworks Gallery. The subject of this one was a collection of fruit purchased at a newly opened fruit stand near my house. 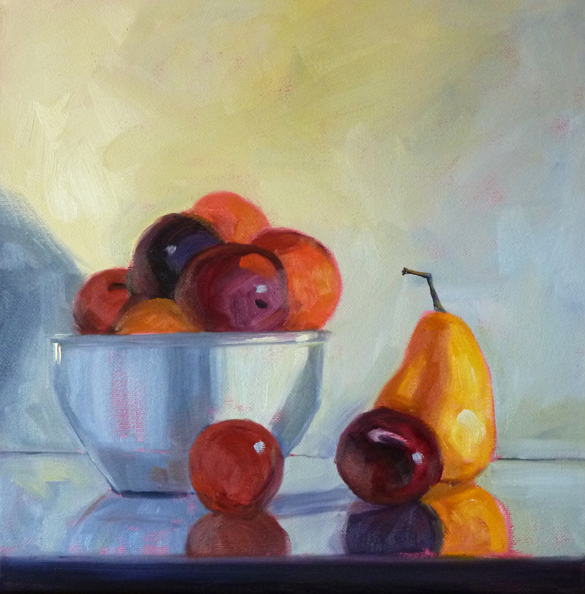 The fruit is sweet and full of color making it delightful to paint and even more delightful to eat when I finished.